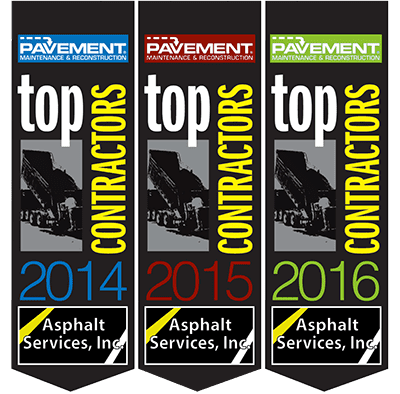 Asphalt Services, Inc. has the confidence to stand by its work with one of the strongest warranties available the northeast. We offer a 3 year limited warranty for all reclaim and full depth asphalt replacement jobs & a 1 year limited warranty for all milling & asphalt overlay jobs unless otherwise specified in your contract. Asphalt Services, Inc. warrants and guarantees the quality of materials and workmanship for stated period in each job type from the date of installation of the materials. Any such area determined to fall within the warranty parameters will be repaired according to industry standards. The repair will be patched and will be visible. There is no warranty on pothole repair or asphalt repairs in parking lots with major cracking. All newly installed curbing carries a 1 year limited warranty of materials and workmanship while all curbing repairs of any kind carry no warranty. Sealcoating, crack sealing and line striping carries a 90 day limited warranty. This warranty does not cover damage due to sprinkler systems left on during or after installation, tire marks, weather related damage (rain, wind, etc.) & people or animals walking across wet sealcoat or paint. All other work not specifically stated carries a 6 month limited warranty unless otherwise specified in the contract. Asphalt Services, Inc. has the right to refuse or alter any warranty at time of bidding with disclosure on proposal. All warranties do not cover damage caused by impact or exposure to/from any foreign substance or other mistreatment of paved surface such as but not limited to: motorcycle stands, dumpsters, jacks, kick stands and even things like lawn chairs. Oil or gas spills that damage asphalt not covered under any warranty. Acts of nature that can cause damage to you pavement are as follows and these will not be covered under this warranty: ground movement, drought or compaction of the earth’s soils, root systems of surrounding landscapes, (this includes all vegetation) oxidation through ultraviolet rays, and ground water under pavement causing undue moisture of pavement base. All warranties void if excavation and sub-base work was completed by another company. Asphalt pavement contains “Liquid Asphalt” which is the black, tar-like substance that holds the pavement together, and this liquid needs time to harden and cure. Your new asphalt could take up to a year to fully cure. Even when fully cured, asphalt pavement can sometimes soften in extreme heat, or harden faster as temperatures drop. To temporarily harden the pavement, you can water down the surface with a garden hose. If soapsuds appear, don’t be worried. This is a reaction between the chlorine in the water and the asphalt. Keep vehicle(s) off new asphalt for at least 72 hours or more depending on temperature. Avoid driving off the edges of your driveway, this will cause it to crack and crumble due to lack of side support. You may support the sides by backfilling the sides with soil. Keep motorcycle and bicycle stands, boat jacks and other sharp objects off the surface. On a hot and sunny day, the sun can easily heat the asphalt back up making it soft and pliable again, therefore caution should be taken when making tight or sharp turns on it. If you wind up causing tire tracking there’s not a lot you can do to fix it. Unfortunately, only time and a little oxidization will make these disappear. Power steering divots are caused by turning your steering wheel while your vehicle is setting in place. This can cause damage to your new asphalt especially on a very hot summer day. If turning around in your driveway is absolutely necessary, try and keep the vehicle moving at all times while you’re turning… moving forward and backwards until you’re turned around. If you have any campers, boats or trailers, and you need to store them on your new asphalt, it’s a good idea to place some plywood underneath each tire in order to spread the weight more evenly to keep small divots or low spots from forming in the asphalt. These divots or swayles are irreparable without causing even more problems surrounding them. The way these are formed is by any combination of several things like the wind blowing, climbing in and out of the boat, climbing in and out of the trailer or camper… this vibrating or moving the vehicle back and forth and wiggles the asphalt back and forth under the tires and eventually causes that low spot or a swayle in the asphalt. To remedy this, place some (3/4”) plywood underneath each tire. Generally you want to about 2 feet on each side of your tires and of course, a couple of feet in length past the front of the back tires. This will distribute the weight more evenly over a larger area and eliminate that potential problem. Your asphalt may look smoother in some areas than in others because of its makeup. Asphalt is composed of various sizes of stone, sand, liquid asphalt and other ingredients which cause a varied texture of the surface. Also, asphalt areas that have been raked and spread with hand tools may appear different in texture from those spread by machine. Sealcoating your asphalt will increase the life and appearance of your driveway. Sealcoating your asphalt will lock in the existing oils to keep the asphalt flexible, which reduces cracking. We recommend that you seal coat your driveway 6 months to 1 year after install and every 2-3 years after that.